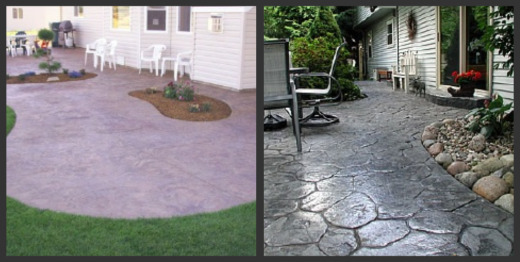 STAMPED CONCRETE PATIOS CAN TRANSFORM YOUR BACKYARD INTO A BEAUTIFUL EXTENSION OF YOUR HOME. A stamped cement patio can be a great addition to your front or backyard environment. A concrete patio can be designed to compliment your outdoor landscape or you may want the concrete stamped to match the style of your interior living space. The versatility of concrete is what makes a concrete patio such a great choice. A stamped concrete patio can be molded into any shape to fit your needs or creative ideas. There are so many textures, colors, and stamped concrete patterns to choose from, deciding which is your favorite will be challenging. One of the most attractive advantages to having a concrete patio is the wide range of colors available. You can choose colored concrete, a shake on color hardener, concrete stain, or a concrete dye. These can also be used together to create many color variations. The concrete can be stamped and textured to look like stone, brick, wood, and tile, to name a few, at a fraction of the cost of pavers. Concrete can be molded into any shape to accommodate your backyard requirements. Concrete is very durable and can stand up to a wide range of weather conditions. With the use of stains, dye, and colored concrete you can achieve a look to match your house or landscape. With all the concrete stamps available your patio will not look like your neighbors does. Staining and sealing a wood deck every year is a lot of work. You will not have sand in the joints with weeds growing up through them like pavers do. You will not have to worry about termites or the wood rotting and splintering. The aesthetic appeal of stamped concrete will boost the value of your home. Concrete is environmentally friendly when compared to wood. Creating an outdoor space with a concrete patio will allow you to spend time with your family, entertain friends with a BBQ, or unwind after work, in the comfort of your own backyard. If you would like to learn more about stamped concrete, read below.